Traction lifts – Lifts, lifting platforms, lifts service – VÝTAHY PLZEŇ elex s.r.o. Throughout the 20 years of its existence, the company Výtahy Pilsen – Elex, LLC has installed several thousands of lifts in different areas of the Czech Republic. Its most significant projects were e.g. Grandhotel Pupp in Karlovy Vary, Hospital of Merciful Sisters in Kroměříž, Faculty Hospital in Pilsen, Palace of Culture in Prague and numerous bank houses, theatres, factories and also blocks of flats. The company has successfully realized some foreign orders, e.g. deliveries to Germany, Latvia, Lietuva, the most distant one to Mexico. The lifts are manufactured in a time-tested reliable traditional way. Their construction, stiffness and resistance guarantee high quality. Thanks to the manufacturing method the products are adaptable to the most complicated arcitectonic demands, so that even the most demanding clients can be satisfied. 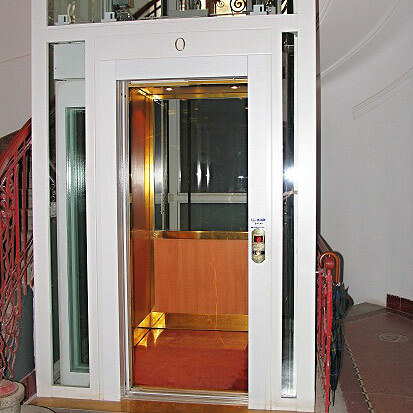 Even standard versions of the lifts are high-quality ones. Our clients can choose from numerous kinds of materials and cooperate on creating final version of the lift. We can produce and deliver lifts from 150 kg of load. Range is amounting to 10 tons. Machine room can be located above or beside shaft. We are able to provide both two speed machine and VVVF machine. Traction lifts are characterized by smooth movement, long working life and power saving. 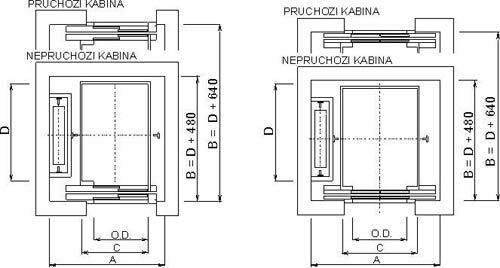 Dimension of the range is shown in the table below. Please, consider this table only as a guide. We are allways able to build lift which will meet your special requirements.